I am not an adventurer. I have a voracious appetite to read all about adventures, and live vicariously through the protagonists of the different novels I consume. I have never been adventurous with my eating either. My tastes are wide, and my pleasures vast, but in terms of trying foods that are not mainstream, I have always been quite apprehensive to do so. I have had the good fortune of being a member of the Entomo Farms team since we began back in January 2014. So imagine, here I am advocating for the eating of insects, encouraging people to embrace entomophagy, but had never, ever, even considered crunching on a critter (unless I was starving and that was all I could forage for my own survival, of course). There was only one course of action. I would have to start eating insects. 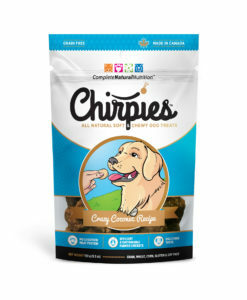 Not only start eating them, bug REALLY eating them- I needed to make them a part of my usual routine, adding powder into my baking and cooking like I was encouraging others to do, and snacking on crickets and worms as if they were nuts or chips. So I did, and I have, and here we are two and a half years later, and I have 3 bags of different flavoured crickets in my pantry (my favourite are the new chili lime crickets that we are developing) and I have a bag of powder in my fridge that I add to my soups and my batters without blinking an eye. 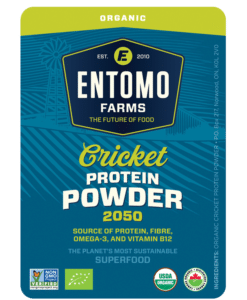 For us here in the West, entomophagy (the eating of insects) is the Future of Food, but for over 80% of the global population, there is nothing futuristic about eating insects. It has been a part of their mainstay diet for aeons. Turquoise seas, matching skies, sands that stretch for eternity. And insects. Tons and tons of insects… for sale, in the market, to eat. Eating insects in Thailand originated in the northeast. The northeast was the poorest part of Thailand, and crops were very hard to grow. Raising cattle was out of the question, and the locals had to be very creative when it came to food. It was very easy to catch insects, and bugs became one of their favourite snacks and protein supplements. For example, when working in the rice fields, farmers would collect grasshoppers, because they were a pest to the crop, and would sell them to vendors who would make them into a snack. Entrepreneurs in the northeast would catch the insects and travel to the big cities like Bangkok, Pattaya, and Phuket to sell their deep-fried insects to the businessmen. It quickly became more than just food for the poor–eating insects became popular amongst all people, including the wealthy, due to their high protein content and favourable tastes. 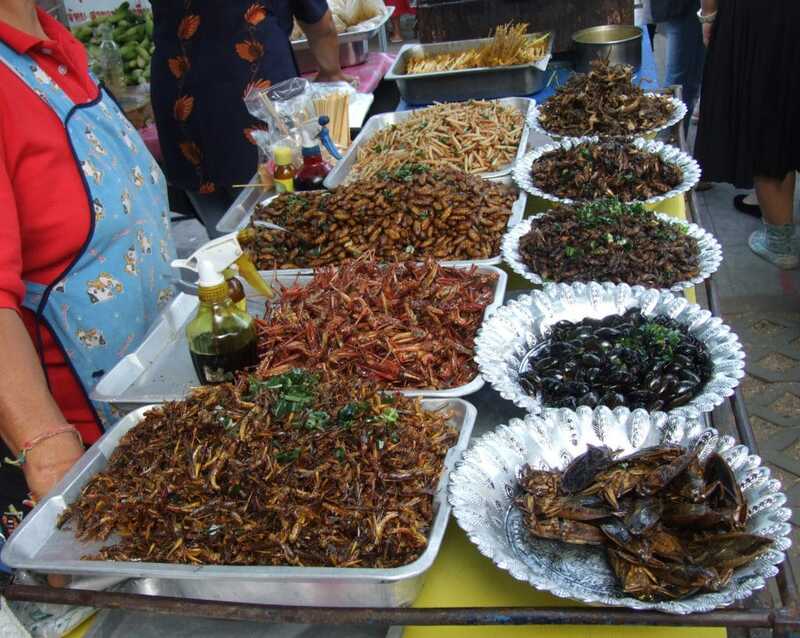 You can find edible insects at the markets during the day, as well as night markets and weekend markets. 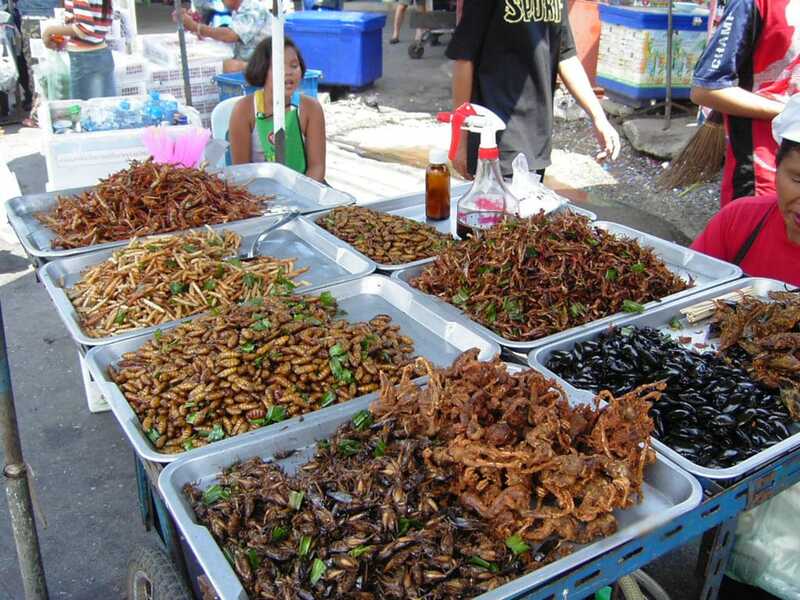 When you go to the markets in Thailand you will see bins full of delicious insects. The most popular are silkworms, grasshoppers, bamboo worms, water beetles, and crickets. It is also common to see cockroaches, spiders, and scorpions. Silkworms and bamboo worms are said to taste milky and creamy. 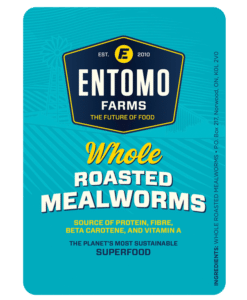 People love bamboo worms because they taste a bit like corn and are slightly fibrous. Grasshoppers, beetles, and crickets are crispy and crunchy. 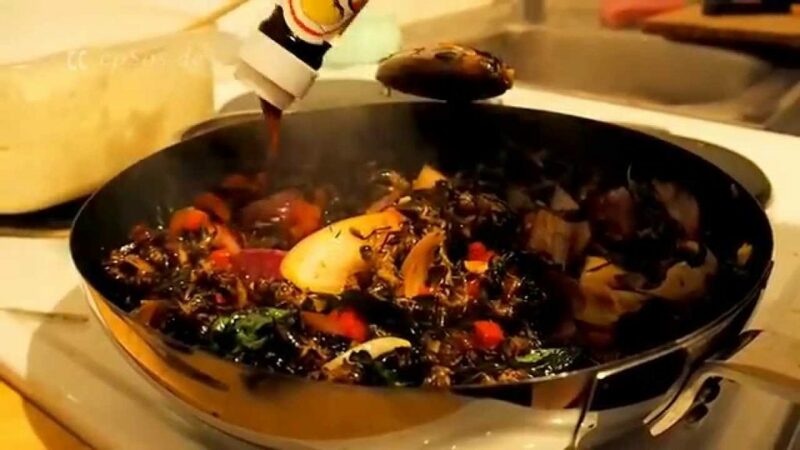 The insects are deep fried in a wok, and are served with some white pepper and soy sauce. Many people love a good beer while they are eating insects–the flavours go very well together. You can get a perfectly balanced meal by eating insects with vegetables. Now I am a bit of an adventurer. I can’t wait to travel to Thailand and sample as many different kinds of insects as I can, but in the meantime, I just might take some crickets, deep fry them, and sprinkle on some white pepper and soy sauce.